[I]nformality is so widely present under existing forms of state socialism that any inquiry into the actual economic, social, political, and even cultural processes of the supposedly “centrally planned economies” is bound to be misspecified unless it takes into consideration the socialist informal sector —(Portes and Borocz 1988: 17). Three central questions immediately arose from this and other similar experiences throughout Cuba that, thus far, have not been answered by the available literature on Cuban tourism or on the island’s “second economy.”2 First, is self-employment (trabajo por cuenta propia — TPCP) a desperate last resort or a constructive bridge to an unsure future for the Cubans who engage in it? Second, how is work as a licensed self-employed worker (cuenta propista — CP) different from clandestine private economic activity? Third, how do the Cuban government’s strict regulations and high taxes affect the CP sector, and what is the intent behind these seemingly illogical and counterproductive restrictions? Beginning with the assumption that both tourism and self-employment will continue to play central roles in the Cuban economy in the foreseeable future, this paper explores the consequences of self-employment in the tourism industry. As Castro inadvertently hints at above: What kinds and levels of “competence” has the introduction of micro-enterprises and self-employment — the “little bit of capitalism” — brought to socialist Cuba? How does licensed self-employment differ from clandestine work? And, what are the practical effects of the government’s strict regulations and licensing requirements? Tourism is nothing new to the island of Cuba. Prior to the 1959 revolution, Cuba was easily the most popular Caribbean get-away for American tourists. Following the revolution, however, the island’s place as an important tourist destination was abruptly reversed. After a brief period of equivocation about what to do with Havana’s extensive tourism infrastructure, the ideology of the revolution came to scapegoat tourism, implicating it as a bankrupt industry that subordinated the island’s economy and political system to the whims of foreigners (Schwartz 1997). The best example of the conversion of tourist facilities from foreign to Cuban use is the famous Havana Hilton which first opened its doors in March 1958, just months before the triumph of the revolution. Its revolutionary name, Hotel Habana Libre, survived as a proud symbol of Cuban sovereignty until the late 1990s, when the French hotel group Tryp, which now collects 50 percent of its profits, tellingly re-christened it the Hotel Habana Libre Tryp. Any understanding of the current Cuban reality, of course, must begin with the changes the collapse of the Soviet Union and the subsequent imposition of the “special period” have brought to the island. During the years 1989-1993, foreign trade declined by 92 percent and the island’s Global Social Product (similar to the GDP measure) fell an estimated 40-50 percent, displacing nearly 20 percent of the island’s labor force. Finally, the minimum wage shrunk to an astounding $2 a month in real buying power, with monthly pensions worth just over $1 on the black market (Mesa-Lago 1994). Reacting to these macroeconomic shocks, President Fidel Castro declared a “special period in peacetime” to begin on August 30, 1990. However, the significant changes in the Cuban economy were not intended to begin a “transition” toward a capitalist economy. Instead, changes were explicitly aimed at enabling survival, preserving socialism, and “saving the revolution.” As if under siege of war, Cubans were forced to make major sacrifices such as experiencing severe energy shortages, a massive reduction in public transportation, the expansion of food rationing, and the disappearance of many basic products. Cuba’s touted social services were negatively affected as vital medical and school supplies became virtually non-existent. Cuban industry and exports also declined; the essential sugar crop dropped by half from 8.4 million tons in 1990 to a mere 4.2 million three years later. The island was forced to look to other areas to bring in foreign exchange. A principal area of economic growth arising from the needs of the special period has been tourism. Tourism has rapidly become the island’s number one “export,” recently pulling ahead of both sugar and hardcurrency remittances. Tourist visits to the island have grown from a mere 300,000 in 1989 to an estimated 1.7 million in 1999, and the number of hotel rooms jumped from 5,000 in 1987 to over 30,000 in 1999. Two million tourists are expected by the end of 2000, an estimate that does not include the tremendous effect an end to the U.S. travel ban would have on the number of foreign visitors. Ironically, the defiant nation that had once scoffed at foreign investment from the capitalist West, is now forced to compete vigorously for hard-currency investment and aggressively seek out partners for joint-ventures in tourism projects. “Who would have thought,” Castro asked in the summer of 1993, “that we, so doctrinaire, we who fought foreign investment, would one day view foreign investment as an urgent need?” (Pérez 1995: 404). Though not entirely new on the Cuban scene, Cuba’s second economy has also expanded significantly during the last decade. In fact, there is a consensus among government officials, analysts on the island, and scholars abroad that as the official, first economy has entered a major crisis since the early 1990s, the unregulated, second economy has exploded in scope and size (Pérez-López 1995). An indicator of the growing economic importance of Cuba’s second economy is the government’s attempts to legalize and incorporate it into the official, first economy. For example, on the 40th anniversary of his attack on Moncada in July 1993, President Castro legalized over 100 kinds of self-employment, depenalized the holding of foreign currency, re-opened farmers’ markets, cut subsidies to many state-run companies, and laid off thousands of workers (Peters 1997: 1-2). The growth in the size of the official “self-employed” sector during the special period has been traced by a number of researchers (Peters and Scarpaci 1998; Jatar- Hausmann 1999; Smith 1999). According to them, the number of licensed self-employed workers grew from 70,000 in December of 1993 (just months after it was legalized) to 140,000 in May of 1994 (Smith 1999: 49). The unofficial government policy of alternately encouraging, repressing, and regulating the self-employed sector has produced significant fluctuations in its size and composition since 1994. Though the sector reached its zenith in January of 1996 with 209,606 licensed operators, it has shrunk considerably (20%) thereafter due primarily to the institution of a quota-based, personal income tax later that same year. For example, by April of 1997 official numbers of the self-employed sector had dropped to 180,919, falling further to 165,438 by April of 1998 (Peters 1997; Jatar-Hausmann 1999). As recently as 1981 theoretical discussions about and distinctions between the “informal,” “underground,” and “second” economies were still tentative and largely inconclusive. Since its origin in Keith Hart’s study of small-scale business in Ghana in 1972 (ILO 1991), all that could be consistently agreed upon was that the “informal sector” was a phenomenon peculiar to less developed countries (LDCs) (Portes and Walton 1981). Contradicting this preliminary conclusion, however, Portes led a multi-country comparative study of the informal economy (Portes, Castells and Benton 1989; de Soto 1989), updating the definition of the informal economy and delineating a number of its common characteristics across different world regions (see also Portes and Borocz 1988; Sik 1992; Los 1990). They found that such a phenomenon exists to different degrees not only in LDCs but also in advanced capitalist economies of the West and in centrally planned economies (CPEs). Effectively, this landmark study “revealed the global scope of what was originally thought to be an exclusively Third World phenomenon” (Portes, Castells and Benton 1989: 2). Furthermore, Portes and his colleagues found that the informal economy seemed to have increased significantly in size and scope since the early 1970s, and their study challenged the common presumption that the only economy worthy of sustained and systematic study was that reflected in official statistics. Despite a number of major disagreements among scholars about the particular causes and entrepreneurial potential of unregulated economic activity, there is consensus on a few of its central characteristics. First, most scholars subscribe to the definition employed by Portes, which characterized informal activity as “the unregulated production of otherwise licit goods and services” (Portes, Castells and Benton 1989: 15). Second, rejecting common negative assumptions about unregulated activity, Portes, Castells and Benton (1989) also agree that the informal economy is not simply the set of different activities performed by destitute or “marginal” individuals in order to survive. Third, strong evidence has been found in many different contexts indicating that the informal economy is in fact intimately linked to the official economy, each comprising different sectors in the same interdependent economic system. Fourth, despite important exceptions, labor in the informal economy tends to be “downgraded.” In other words, workers in this sector can expect lower rewards and protections than they would normally receive if formally employed, a characteristic that leads to the systematic use of undocumented, ethnic-minority, female, and child labor in the informal sector. Finally, the informal sector is commonly characterized by a government attitude of tolerance despite its illegal or unregulated nature. This ironic acquiescence can be understood as a government strategy intended to address inefficiencies and periodic crises such as unemployment in the regulated economy. With specific reference to centrally planned economies (CPEs), Pérez-López has noted the inherent links between the official and “second” economies, observing that “the second economy aris[es] as a result, and address[es] the failures of, the official economy” (1995: 25). Grossman began giving systematic scholarly attention to the unregulated economic activity common in CPEs as early as 1977, with a seminal article on what he then termed the “second economy” of the Soviet Union. In that article, Grossman set down a working definition of the “second economy” as those productive activities which meet at least one of the two following criteria: (1) they are to a large extent carried out in knowing violation of existing laws, and/or (2) they are directly engaged in for private gain (Grossman 1977: 25; Pérez-López 1995: 13). Thus, the key difference between the “informal” economy as it exists in underdeveloped regions of the third world, and the “second” economy as applied to CPEs is one of legality vs. control. In other words, the “second economy” expands the concept of informality to include not only economic activity that is illegal or unregulated by the state, but also all profitdriven activities (legal or not) which by definition contradict the socialist ideal. In her collection of essays on the second economy in socialist states, Maria Los (1990) echoes this ideological definition: “the second economy includes all areas of economic activity which are officially viewed as being inconsistent with the ideologically sanctioned dominant mode of economic organisation” (1990: 2). Therefore, this ideological criteria would specifically include formally legal but ideologically suspicious activities such as licensed self-employment, an important distinction for the Cuban second economy where licensed cuentapropistas struggle alongside clandestine self-employed workers. Echoing both Los and Pérez-López, Jatar-Hausmann has appropriately termed the ambivalent position of licensed self-employed workers in 1990s Cuba: “legal but not legitimate” (1999). The Hungarian economist Endre Sik (1992) has looked specifically at the transformations of the second economy within his own country as it undergoes a transition from a centrally planned to a market economy. While not attributing the transition itself to the growth of the second economy, Sik does grant that the impact of the second economy on the transition has been considerable. He has found that while the second economy “lubricated the wheels” of the state-run sector, it also distorted its functioning (1992: 170) by implicating all levels and sectors of the first economy in routinized illegality and corruption. A whole society engaged in short-term profit maximization had the unintended consequence of creating a nationwide sub-culture of favor networks4 and loopholes that has made difficult the formation of an efficient, responsible, tax-paying workforce in a market economy. According to Sik, Hungarian workers learned to distrust the system and looked at state-imposed controls with hostility, while they developed mutual trust and support amongst themselves. However, Sik maintains that the existence of a well-developed second economy in Hungary did allow for a relatively non-violent transition. In essence, these workers had developed valuable social networks, accumulated capital, and made significant investments to the extent that come a transition, “they had more to lose than their chains” (1992: 173). Building on this fresh yet tentative research on second economies around the world, Pérez-López (1995) has applied the concept of the “second economy” directly to the Cuban case during the “special period.” Like Grossman (1977) and Los (1990) before him, Pérez-López makes the important observation that the critical criterion in his own definition of Cuba’s second economy is “control” rather than “legality.” In other words, he understands the second economy concept as appropriate for Cuba because it includes “all those economic activities which are inconsistent with the dominant ideology that shapes the official (“first”) economy” (1995: 14), not simply those which have been officially outlawed. Furthermore, Pérez-López contends that the “second” economy concept fits the Cuban context better than that of mere “informality” since in Cuba the rise in individual entrepreneurial activity takes place in a political context where societal gain is preferred over private gain. Therefore, he also distinguishes the second economy from the somewhat broader concept of the informal economy as it captures “all forms of deviations from the model of a socialist command economy” (1995: 13).5 It is this particular understanding of the second economy that I employ in my study of Cuba. In order to better focus the study and have a means of comparative analysis with which to approach the research questions outlined above, qualitative research was carried out in three somewhat interconnected areas of the “informal tourism economy” that seem to be the most lucrative, dynamic, and sizeable: (1) lodging (casas particulares); (2) small-scale, privately run restaurants (paladares); and (3) transportation (taxis particulares). Because of efforts during the last decade by the Cuban government to incorporate clandestine self-employment into the official economy, many cuentapropistas now serve tourists legally with government licenses and must pay monthly income taxes. Thus, in looking at workers in the second economy, both those CPs who pay taxes and those who work illegally without the benefit of a government license were included in the study. Though some anecdotal information was collected in other sites throughout the island, this study was carried out primarily in Havana, where licenses are theoretically available, where selfemployment is wide-spread, and where foreign tourists are concentrated (interviews were conducted in the municipalities of Habana Vieja, Centro Habana, Plaza, and Playa). More specifically, building on initial interviews and observations collected in August 1999, this paper is based on 30 in-depth interviews conducted during July 2000, with the proprietors of ten private home-stays, ten paladares, and ten taxis. The homes, restaurants, and taxis were strategically selected in order to compare licensed self-employed workers with their unlicensed (clandestine) counterparts. Following interview research done in Cuba by other investigators (Peters and Scarpaci 1998; Jatar-Hausmann 1999; Smith 1999; Holgado-Fernández 2000), the subjects for this study were selected in a casual, snowball method. Potential subjects were identified through observation and, on many occasions, through referrals by other self-employed individuals. I generally met with and interviewed the self employed individuals in their place of business (usually their own homes), explaining that I was a researcher interested in the growth of Cuba’s private sector and how it interacted with the tourism economy. The interviews normally took between 30 and 90 minutes to complete; the first part was usually dedicated to explaining the research project and gaining the trust of the subject. Though many respondents were quite guarded in their responses and most asked that their names not be used, no one refused to participate in the survey. During many of my interviews with CPs in Cuba, I was met with the following explanation of the island’s second economy: “En Cuba todo es prohibido, pero todo se hace,” (in Cuba everything is prohibited, but everything is done); another version of this same quip goes, “En Cuba lo que no es prohibido, es obligatorio” (in Cuba that which is not prohibited is obligatory). Thus, while a significant segment of Cuba’s underground economy has been legalized and incorporated into the official economy through fees, taxes, and licensing requirements, much self-employed activity remains beyond government control and many Cuban entrepreneurs opt not to seek out a legal license for their clandestine activity. While legalizing formerly unregulated economic activity allows the government to reduce inequalities through taxes and fees (revenue theoretically shared with the population at large), such a strategy also allows the government to track CPs and control their activities more effectively. Furthermore, legalization allows the government to benefit financially from economically significant transactions that once took place beyond its reach (even if a less onerous tax system would likely bring the government much more revenue). Finally, licensed CPs are easily targeted when the state decides, as it periodically has in the past, that such activity should be restricted or eliminated altogether. My own and other studies (Peters and Scarpaci 1998) have found that many clandestine CPs have decided to postpone applying for a state license precisely because they fear such an open declaration would make them potential targets in future capitalist purges. Another distinct possibility behind the license requirements for CPs is that their aim is simply to prohibit such activity by taxing it at such a high level as to make it unprofitable. In my interviews, many clandestine CPs who rent out rooms to foreigners justified their reluctance to obtain a license by explaining that doing so would be prohibitively expensive. One frustrated Havana resident who periodically rents out a spare bedroom in her home explained that she would have to pay a $100 USD registration fee coupled with a $250 USD monthly rental tax to the government regardless of occupancy. She argued that she would have to dedicate herself to finding renters on a full-time basis in order to have enough occupants just to break even. Thus, along with many other Cubans, she has decided to occasionally rent out her apartment clandestinely, avoiding what she considers an exorbitant and prohibitive tax. Ironically, it is not simply clandestine CPs who operate outside the law. Again and again in my interviews, I discovered that the CP license was used in practice as a cover, protecting its holder from suspicion while he or she engaged in many money-earning activities not included in their license. One licensed CP in Santiago whom I interviewed described her fear at not having enough residents to pay the $200 monthly tax required of renters in that city. She has come to have to rely on middle-men (whom she pays $5 per day) to bring her renters from the train station in order to keep her residence full during the low season. Also, she has resorted to illegally serving meals to her guests at extra cost in order to augment her income, enabling her to pay the monthly tax. Licensed CPs have developed a host of ingenious strategies or trampas in order to ensure that they are able to pay their tax at the end of each month and still make a profit. For example, one common strategy is to substantially underreport one’s income, making the year-end, progressive tax on earnings as low as possible. Among my sample, this strategy seems to be employed most by taxi drivers and renters as they can easily underreport the amount each clients actually pays, while the paladar operators are less able to use this tactic since their sales receipts are more easily tracked. In the private housing sector, a common tactic used to ensure sufficient income is renting more rooms than one’s license allows. For example, one renter I interviewed routinely uses a second room in his home when the official one was occupied. He even has a special arrangement with his next-door neighbors to house guests in their home when both of his rooms are full. A further strategy used by nearly all renters is that of serving food to guests without declaring it part of their business (which would push their monthly tax up by 20 percent).7 Finally, a strategy commonly used by nearly all self-employed individuals in the housing and paladar sectors is that of utilizing various friends and connections in order to bring in more revenue and serve their customers better. For example, many CPs hire non-household and non-family employees to aid them in their daily tasks. Others commonly pay commissions to middlemen to bring in clients. Ironically, many private taxi drivers (commonly called boteros in today’s Cuba) play the double role of driver and middleman since they are both mobile and knowledgeable about the available private markets. According to a number of those interviewed, government restrictions and licensing requirements function as a “Sword of Damocles” that the state can hold over their heads. Laws are enforced when enforcement is in the state’s interest, yet these laws need not be enforced if the population can be intimidated into policing itself. Some of the more insightful CPs explained this seemingly illogical government policy of alternating legalization and increased restriction on self-employment as a government policy of retaining absolute control over economic activity on the island. These Cubans reasoned that the government would allow only that level of independent economic activity that would address scarcities and inefficiencies in the first economy, yet restrict activities when they began to threaten centralized control. This, however, is still an open question. The previous experiences of the CPEs of Eastern Europe indicate that a government cannot absolutely and indefinitely control second economy activity. While government policies of benign neglect and limited legalization of the second economy can grease the rusty wheel of a centrally planned economy in the short run (allowing individuals to “resolve” their many consumption problems and ironically enable the short-term continuance of the system as a whole), in the long run such activities have been known to pose a significant threat to topdown control of both the economy and polity. This section of the paper is organized around two of the three self-employment sectors focused in the research: casas particulares and paladares.8 Furthermore, each of the two following subsections will attempt to share tentative answers to the three central research questions outlined in the introduction. First, what are the socioeconomic effects that this new kind of private economic activity brings to the island and to the individuals who engage in it? Second, what is the relative size, incentive structure, and profitability of licensed/regulated informal activity vs. unlicensed/ unregulated activity? And third, what is the purpose of state regulation, licensing requirements, and taxes for the legal sector of the informal economy? These findings are admittedly preliminary. The interview data collected still needs to be analyzed and systematized in a more coherent fashion. For this reason, I will here supplement my analysis with descriptions (as well as a few quotations) of a number of instructive cases of self-employed workers. Socioeconomic Effects: Unlike most other licensed self-employment in Cuba, renting rooms in private homes only came under state regulation in the summer of 1997. Prior to that, those who engaged in this type of activity did so in a kind a “no man’s land,” as one respondent put it. Though the tax system for private homes is very similar to that applied to other areas of self-employment, it has a few unique features. First, the amount of one’s monthly tax is based largely on one’s location relative to Havana’s primary tourist hotels. For example, a renter in La Rampa area of Vedado must pay a $250 monthly tax, while the monthly tax is just $100 for most residents of Centro Habana and other parts of Plaza. Second, selfemployed renters must pay a year-end percentage of their earnings after deducting 10 percent for expenses and the total year’s payments in the monthly CFM tax. Therefore, unlike many of the paladar proprietors in my sample who are able to avoid the yearend tax altogether based on their high monthly payments, private home-stays must pay an extra tax at the end of the year based on their after tax earnings. Third, private home renters seem to be the most vulnerable to fluctuations in the tourist economy since the vast majority of their customers are foreigners (not necessarily the case with paladar owners and taxi drivers). These special characteristics have the result of pushing many potentially legal renters underground and pressuring those with licenses to cheat in order to survive. When asked if he could change one thing about the tax system, a third licensed renter named Oscar responded, “Taxes should be based on occupancy and income and not on a quota system. The Cuban economy is not one that gives incentive to capital as in the United States. It is designed to do just the opposite — discourage it.” Given these many restrictions, however, Oscar does admit that he still fares better than others and has a disposable income. As an example of the very slow growth of the sector and difficulty of saving or investing much money, he shared that he has been saving part of his earnings each month ($50 USD) for the past five years in order to buy a car. He explained that he wants to buy a diesel powered American car that has a price tag of $6,000. The car would allow him to take his family on outings to the beach once in a while. He concluded by reiterating that no one is in the housing business to make it rich. According to him, most go into the CP sector to ensure their economic survival, and possibly to have a little bit of disposal income: “Thanks to this, I am alive,” he explained. “Without this I’d be a dead man”. Licensed vs. Clandestine Renters: While one would like to use the licensed/unlicensed demarcation as the central distinguishing element in analyzing rental activity, it remains to be seen if there is any real sociological difference between the two. My impression is that the licensed renters charge more, rent more often and intensively, and dedicate more time and effort to renting as their principal economic activity than do their unlicensed counterparts. This seems to be so because of the very high government fixed minimum monthly tax (CFM) that must be paid by those with licenses, regardless of occupancy. In other words, these licensed renters must pay between $100 and $250 (which changes depending upon location in the city/country) per month for the right to rent out one room of their homes, regardless of whether they have clients or not. Of course, this tax grows substantially if one wants to declare more rooms for rent or serve food to the renters. Furthermore, clandestine workers seem to treat their rental activity as a secondary activity (even if it is primary in terms of the amount of income it generates), while few licensed renters can avoid to be casual or lax about it due to the quota tax system. Another tentative lesson from my interviews is, as one respondent put it: “We all cheat a little” (Todos hacen su trampita). In other words, while the legal distinction between licensed and unlicensed CPs is important, it is not absolute by any means. Actually, Miguel, a former renter who is interested in returning to the fold, said that he was unable to make enough to pay the tax the first time around due to his honesty and strictness in following the law. If he is able to get his license reissued (which seems doubtful given the government’s refusal of issuing many CP licenses), he was clear in stating that this time “I will do what it takes” to stay in business. Thus, while clandestine CPs operate totally outside the law, even licensed CPs make a large part of their earnings (the range was between 10% and 75% in my interviews) by practicing “creative bookkeeping” and bending the self-employment rules. In this way, the CP license becomes more a protective façade, used to mask host of activities either not allowed or not specifically licensed. It is not merely a legalizing mechanism that separates the law-abiding citizens from supposed delinquents. Ironically, one renter had originally printed up business cards that read, “Room for Rent — Specialist in Food Service” (Rento Habitación — Especialista en Gastronomía). He explained to me that due to his special talents in the kitchen, he had originally intended to serve food to his guests. However, he found this to be both too costly for tax purposes and too time consuming. Thus, he only occasionally serves food to his guests, charging them a few dollars for each meal, yet still has no authorization to do so. While his cards were clear in stating that he only had one room for rent, another licensed renter gave me a handful of business cards openly declaring “Habitaciones Doña Amelia,” the use of the plural indicating that she did rent more than one of her many rooms in an old, outwardly crumbling mansion in Vedado (even if she admitted to paying tax on just one of the rooms). The truly ironic aspect of her business cards, however, was the fact that they were double sided. While one side assured the holder of a comfortable and agreeable stay, the reverse side declared, “Dr. Amelia Betancur — Specialist in Traditional Medicine” (Dra. Amelia Betancur — Especialista en Medicina Tradicional). The tax is designed to drown the client, not to make money for the government or share the wealth with the people. If profit were the government’s intention, they would lower the tax and make a lot more money because everyone would have an incentive to sign up. The strict and ridiculous laws and taxes have the effect of pushing people underground and causing those with licenses to cheat. The law as it stands only benefits the larger entities (usually owned by ex-ministers, ex-military, or ex-members of the central committee). These people have large homes with many rooms and can earn enough to stay afloat by declaring one or two yet renting many more. The little guy is pushed out of the picture or must live in fear of not earning enough to pay the tax. A recent article from Cuba’s fledgling independent press estimated that as many as 35% of Cuba’s tourists stay in private homes and that an estimated 200,000 tourists had lodged in such homes in the first six months of 1999. The article indicated that Cuban authorities are becoming concerned about the loss of tourism revenue to the second economy and reason that they cannot adequately “protect” tourists who stay in private homes. It is worth asking whether the government also wants to “protect” Cubans from the “corrupting” influences increased exposure to foreigners may bring. The article also quoted a government official who indicated that rising levels of bribery and corruption are also worrying regulators of self-employment activities, “There is a limited confidence in the capacity of government inspectors to resist the bribes of the proprietors” (Zúñiga 1999a). In my own research into the private housing market, only two respondents admitted to giving bribes to government inspectors. However, most of the others admitted that it was a fairly widespread practice. One respondent mentioned that of the three different types of inspectors (housing, immigration, and tax) the immigration inspectors were the “least bribable” being members of the military. A number of respondents agreed that inspections were most common toward the end of the year, hinting that they came in search of extra cash for the holidays. Sandra, a former licensed renter now living in Miami, openly admitted to paying bribes on a regular basis. She even stated that some housing inspectors played the secondary role of middle-man, occasionally showing up at her home with foreign tourists in tow, searching for their own commissions. Socioeconomic Effects: As compared with the proprietors of casas particulares, paladar owners express a much deeper frustration with government restrictions. My interviews with them reflect a steep rise in government taxes over the last five years, in one case rising from 2,500 Cuban pesos per month, to 5,000 after the first two years of operation, and then to 10,000 per month by the fifth year. Also, according to my sample of paladar proprietors, the government has closed off the issuance of new licenses for private restaurants, not yet the case for casas particulares. One advantage that paladares have over those active in the housing market is that they need not rely exclusively on foreigners for their clientele. Instead, most of the paladares in my sample have a mixed (if predominantly foreign) clientele, especially those more affordable ones that charge in Cuban pesos. Furthermore, possibly as a result of increased government vigilance, clandestine (unlicensed) paladares were much more difficult to locate than was clandestine housing. Finally, given the large number of paladares which have been forced to close their doors in the last few years and the constant struggle in which the remaining ones must engage to stay in business, I would conclude that the economic effects of the existence of private restaurants is negligible. When asked what it was he likes best about being a cuentapropista, Baudelio, a middle-aged former university professor who runs a paladar in the La Rampa area, was quick with a laundry list of benefits to working for one’s self. First, he mentioned that he is able to work at home. Second, he argued that he has more money and he can do with it as he pleases, investing it in ways that he decides and thinks best. Third, though he works long hours and is ultimately responsible for every aspect of the business, he said that he has the ability to work when he likes and take off when he decides. In other words, he enjoys being independent, saying, “Here, I’m my own boss.” Finally, he argued that being a cuentapropista enables him to ensure his family’s well being. He even argued that this strategy should help the state out since, “If the family flourishes there is less to worry about for the state.” Of course, even though he saw this as an ideal, he knew that the state does not see his work in that way. “What I do,” he understood, “is contrary to the system of the country.” When asked to elaborate, Baudelio mentioned that beyond the capitalist nature of his enterprise, in the past any association with foreigners was seen as suspect. Now, however, his business runs mainly due to his contact with foreigners and he sees himself as “restructuring relations with foreigners” through his many international contacts. Licensed vs. Clandestine Paladares: Though she has struggled with appeals for two years in order to have her business license reinstated, Blanca, a middle- aged retired economist who ran a financially successful paladar for almost four years, seemed almost resigned to the fact that she will never get permission to open back up again. When I asked her why another member of her family didn’t get a new license, she explained that the government has stopped issuing licenses for new paladares. She sarcastically, almost bitterly, explained to me the government’s official “política” on the closure of paladares. “It’s not the intention of the government to close them down. If you follow the law, you will have no problem” she repeated while smirking and rolling her eyes. “If you get fined and closed down you have no one to blame but yourself,” she ironically explained. According to her, then, the government strategy is very wise, if also quite devious and hypocritical. Those who get closed down can be labeled criminals, cheats, or even the infamous lumpen, while those who remain are that much more wary about violating the law. What could be seen as a structural imbalance or flaw in the economic system, is instead interpreted for the public by the government-controlled media as the result of a few criminal, or capitalist “bourgeois” elements trying to cheat an otherwise smooth, egalitarian socioeconomic system. The sword of Damocles can be hung over the heads of those who remain, while the government can claim to simply be enforcing the law when it revokes the licenses of those who cheat the system. Furthermore, when paladares turn in their licenses “voluntarily” after finding that they can not make profit enough to pay their monthly taxes, the government can claim that they gave capitalism a chance and that it failed. Their hands remain clean. An interview I had done with a formerly licensed paladar owner in Habana Vieja named Carlos who voluntary gave up his license illustrates Blanca’s arguments well. I only had to ask a few questions of him before he was off describing and explaining for me the many trials of running a paladar in Cuba. Overall, his general attitude was one of frustration with all the government’s taxes and regulations. He gave me many justifications for his giving up his license about a year ago and reopening just a few weeks later without one. Besides avoiding the $900 per month tax that he had to pay as a licensed paladar, he explained that working underground allowed him to avoid harassment from inspectors who would periodically come by to enforce the many “repressive” regulations placed on private restaurants. He reminded me that paladares could not serve either lobster or beef and that the state limited the number of chairs they could have. In addition to this, he complained that it was nearly impossible to obtain all of his inputs (food) from the state suppliers. He explained that most tourists do not want the same pork and rice that they can get in their countries, but instead come to Cuba in order to try some of the island’s great seafood. He also explained that the typical paladar clientele were the less wealthy, more adventurous types who were in search of a more authentic Cuban experience than could be found in the typical state restaurant. Furthermore, he argued that he was not stealing anything from anyone but only working honestly to make it in a country with very few options. Said Carlos: “If you ask me to work without pay today, fine. I can sacrifice a day, I’m with you. But don’t ask me the same tomorrow. Tomorrow I will want a reward.” He also commented that the government needs to find a balance between reward and sacrifice, even if for its own benefit and long-term survival because it cannot expect the population to live through the special period without resorting to new means of generating private income. He argued that if the government does not provide an escape valve, allowing people the room and flexibility to resolve their economic problems, frustration could grow to a boiling point — and explode — threatening the existence of the system itself. The Purpose of Regulation: When compared to private home-stays, paladares seem to be under much more pressure from government inspectors to close their doors. For example, a recent closed-door meeting of the Communist Party and the Assembly of People’s Power focused on Havana’s paladares. It seems party officials are increasingly worried about the fierce competition these eating establishments are posing for state run and tourism restaurants. Official numbers from 1999 cited in the article place the city’s food service and tourist restaurants at 12,416, while there are only 466 legally recognized paladares. Officials cited an increase in legal violations where restaurateurs have served prohibited products (beef and seafood) and charged patrons in dollars without government permission. Proprietors have also been accused of hiring employees outside their immediate family and expanding their operations beyond the legal limit of 12 patrons. Cuban law stipulates that paladares should be strictly family businesses with maximum seating of just 12 patrons. Furthermore, they are authorized to charge only in moneda nacional (national currency) unless they have obtained a specific license to charge in dollars, with the condition that all taxes are also paid to the government in dollars (Zúñiga 1999b). Whether the motivation behind government restriction of paladares is reducing competition or doing away with an ideologically anachronistic form of business in a supposedly socialist context, my interviewees certainly expressed anxiety at the constant inspections and strict laws. For example, during my interview with Baudelio, he noted that he has been in business for four years and seven months and that his is one of the few remaining paladares in the Plaza municipality. He estimated that a year and a half ago (December 1998) there were as many as 2,500 paladares while now there are no more than 16 or 17 in his municipality (Plaza).9 He hinted that these paladares did not go out of business due to lack of business, exclaiming, “They sold a lot” (¡Vendían!). Instead, he explained that they have been pushed out of business by rising government taxes and by “other methods.” In other words, according to him the government has been looking for excuses to close down these paladares and hygiene and/or regulation violations are only some of their many justifications. “They look for excuses,” was the way Baudelio put it. When asked to describe the biggest obstacles he faced in running his business, Baudelio did not hesitate to answer that government inspectors are his biggest headache. According to him, they do not come to visit exactly to “inspect,” but “with full intention to find negative things” (con plena intención de encontrar cosas malas). Furthermore, he openly and convincingly argued that the government’s intent was plainly one of doing away with the paladar sector, saying, “It is clear that their intention is to close down the paladares” (Queda claro que su intención es de cerrar los paladares). Furthermore, he made the observation that the inspectors are even give closure goals or quotas. “Back when the repression began,” he explained, “they had goals to close 2 or 3 paladares a month.” Recently however, “they are trying to close down as many as 20 to 30 each month.” When asked what were some of the methods used to trip up the paladar owners, he said that the inspectors might focus on an insignificant item like a bottle of oil or a salt shaker. They ask for proof of how it was obtained and must be shown both the receipt from the cash register as well as the hand-written, itemized receipt (factura). If either of these is missing, a fine of 1,500 Cuban pesos can result and the business license can be revoked. Finally, Baudelio mentioned that after the “opening” (apertura) of 1994, the state has gradually but inexorably moved to restrict, repress, and do away with the paladar sector of the CP economy. According to him, besides the strict regulations, high taxes, and steep fines, the government recently froze all requests for new paladares. Elena, another licensed paladar proprietor, echoed many of Baudelio’s complaints. For example, when asked what she would change about the tax law if given the chance, she argued that she and the other micro- entrepreneurs had no real complaint against having to pay their fair share of taxes. In fact, she explained that she would gladly pay her taxes if they were based on her income and not derived from a quota system. Also, she took issue with what she saw a ridiculous restrictions such as forcing her to obtain all her inputs through state stores in dollars. She complained that there were no wholesale stores where CPs could go for supplies. “They should set up a market where the self-employed can make purchases,” she argued. Finally, she saw as illogical and repressive the entire existing system of taxes and incentives. “The government doesn’t permit many things,” she explained. “They give you fines. They are always showing up looking for a receipt for our purchases.” She concluded, “It is obvious that the objective is to close down (cerrar) not to encourage (crecer) the business of the self-employed.” In other words, instead of facilitating the growth of the CP sector from which the government could benefit financially through increased revenue and tax compliance, Elena feels that the government’s current regulations act as a disincentive to potential CPs driving them or keeping them underground where they pay no taxes and earn little money for themselves or the state. According to her, however, when the government represses the sector through fines and taxes no one discontinues working, they simply give up their licenses and continue to work clandestinely, as is confirmed in Carlos’ case. Lessons from other Latin American contexts about the role of the informal economy and the second economy in the CPEs of Eastern Europe suggest that these sectors can produce entrepreneurial development, individual mobility, micro-enterprise growth, and even pressure for larger systemic change. Such findings make study of Cuba’s second economy an important indicator of social change. However, the conclusions about the second economy garnered from other national contexts have not been consistent or generalizable. Simultaneously bemoaned as a “last resort” and celebrated as the “bridge to the future,” Cuba’s second economy has not yet been subjected to the rigorous, in-country study required before this debate can be resolved. The possibility remains that state restrictions will so debilitate and discourage the self-employed sector that there may be little left to study in the future. Despite this possibility, this research project has sought to begin just such a process. The transitional experiences of the formerly socialist countries of Eastern Europe indicate that the contradictions of Cuba’s second economy could lead to greater conflict and socioeconomic inequality during a future transition to a market economy. However, these experience also teach us that a thriving second economy can act as a brake on the growth of chaos during a transition, giving citizens an incentive to protect their investments. Returning to the first of my original research questions: What are the socioeconomic effects that this new kind of private economic activity brings to the island and to the individuals who engage in it? Are selfishness, rugged individualism, and inequality the fruits produced in these new islands of capitalism? Does activity in the second economy socialize its participants in tax evasion, criminality, and “anti-social” behavior? Does the government-run tourism economy suffer “unfair competition” from these clandestine or semi-clandestine operations, which actively and unapologetically place private profit over the public good? Or are self-employed Cubans developing entrepreneurial skills and attitudes? Are they creating jobs and other backward linkages that help the larger economy? And are they building up capital, creating the backbone of a small-business sector, enabling the establishment of private investment and credit systems, and laying the groundwork for a more stable, diversified, and more fully “Cuban” economy? My research indicates that those who engage in informal economic activity are not among the most desperate of Cubans. Though licensed CPs as a rule have more capital and make more in terms of profit than their clandestine counterparts, neither group seems to be choosing the self-employment option out of desperation. Instead, they are consciously investing the little material capital and the enormous inventive talent they have in order to “live a little better”. However, even if many CPs are making many times more in the second economy than they made in the first in Cuban pesos, this comparison has increasingly lost its meaning and force over the last five years since nearly everyone needs access to dollar income over and above the peso salary to insure sheer survival. Therefore, to say that these CPs earn substantially more than in the past, does not mean that these Cubans are becoming a new wealthy class. Instead, this is a group of people who are able to survive and live more comfortably than others, with a bit of disposal income. On average, the CPs work much longer and harder than state employed Cubans and produce more for themselves and for the country. They are as far from an “idle rich,”parasite, or lumpen class as can be imagined. However, despite the key role CPs play in sustaining many households, they currently do not present an economic or political challenge to the state, especially due to the continued existence of innumerable restrictions and sanctions on their growth. What do my findings say about the relative size, incentive structure, and profitability of licensed/regulated informal activity vs. unlicensed/unregulated activity? Is there a sociological difference between licensed and unlicensed second economy activity? The Cuban government clearly categorizes them in two different legal camps, but ideologically they both cut against the ideal of a socialist (state-run and centrally- planned) economy. My findings are clear in uncovering that while some CPs may be legal, none are seen by the Cuban government as ideologically legitimate. Furthermore, existing state regulations systematically drive potential CPs into clandestine activity, or force those with licenses to routinely violate the law in order to keep those licenses. It would seem that the government could profit much more from CP activity by lowering taxes and/or tying them to earnings, than it currently does. How then do we understand a seemingly illogical policy of extremely high and prohibitive taxes? The Cuban government has never seen the self-employed sector as more than a stop-gap measure, employed during the economic crisis with the ironic purpose of “saving socialism.” The government never intended its economic adjustments to be the beginning of any “transition.” Nor has the government ever described the private sector as a good thing. Instead, it is consistently portrayed as a necessary evil in the short-term. Thus, with a relative economic recovery underway, we should not be surprised to find the government slowly, yet inexorably “choking the sector to death” (in the words of one interviewee) with increasingly draconian laws. The government policy toward the self-employment sector cannot be explained from a purely economic point of view. Instead, restrictions derive from a demonstrated desire to retain absolute political control which is likely to be threatened by the growth of a private sector, however small. Thus, licensing requirements and taxes on the self-employed are not intended as a redistribution of newly acquired wealth nor as a measure aimed at countering the island’s growing inequality. Instead, the stringent taxes, fees, and regulations are designed to make private enterprise so costly that it becomes all but impossible for the self-employed to accumulate private wealth. One question I will leave open-ended is whether the Cuban government can go back to a more orthodox version of a centrally planned economy. The government seems to have both the political power and the political will to do so. It may find, however, that the self-employed sector has become too extensive and rooted in the family economy (and in national economy through multiplier effects) to easily do away with it. Though remittances and tourism have grown substantially over the last decade, it is doubtful that they alone would be able to compensate for the elimination of Cuba’s extensive self-employed sector. Furthermore, as one interviewee commented, “No one is an idiot” (nadie es tonto), and it is well known that the government would be shooting itself in the foot by eliminating a sector of the economy that fills a gap which the government has not succeeded in addressing alone. 1. The author would like to acknowledge a grant from the Cuban Studies Institute of Tulane University which enabled him to carry out this research. An earlier version of this paper was presented in March at the LASA 2000 meeting in Miami, Florida. 3. 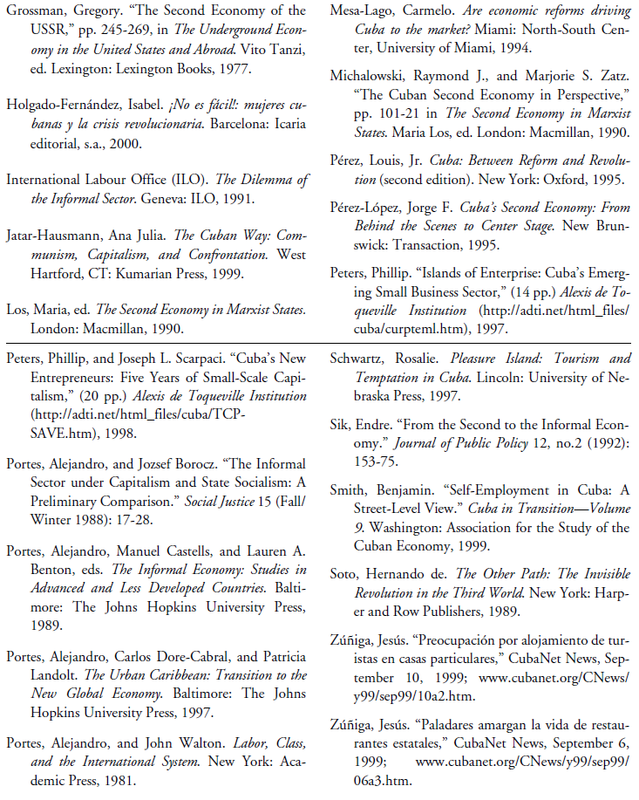 See Peters and Scarpaci (1998) for further information on the growth of self-employment in Cuba during the 1990s. 6. It goes without saying that doing sociological research in today’s Cuba poses special challenges for any researcher, native or foreign. Added to this is the piece of advice given me by a respected Cuban sociologist, “Be careful and skeptical, we Cubans have a tendency to exaggerate the truth or tell you what we think you want to hear.” Recognizing these very real stumbling blocks, however, does not mean that meaningful sociological research is impossible in Cuba. Cuban researchers benefit from a deep and personal knowledge of the setting, language, and culture. They have knowledge of and special access to data sources, key informants, and the research environ ment. However, given the politically charged atmosphere characteristic of the island, Cuban subjects are unlikely to trust their fellow Cuban researchers with their secrets — especially if the focus is on ‘delicate’ matters like self-employment. There is a palpable fear that the researcher, being Cuban, may share the information with the state or inadvertently expose the subjects. Foreign researchers, on the other hand, are much less likely to have a personal knowledge of the setting, culture, or language. Furthermore, their access to data, informants, and the research environment is much more limited. However, in my experience Cubans are much more likely to open up and show their “true face” to a foreigner than to a fellow Cuban. Ironically, as I was surprised to find again and again in my interviews, the common Cuban use of the doble moral (two faces) makes little sense when interacting with someone who is not part of the society or subject to its rules. Added to this is a deep desire for many stressed self-employed individuals to vent, getting their frustrations “off their chest” (desahogarse), a process whereby a foreign researcher acts as a kind of confessor. Finally, many Cuban CPs expressed a desire to teach foreigners about the reality of Cuban society, counteracting both the negative or simplistic image Cuba may have abroad as well as their own government’s propaganda. 7. Likewise, some paladar owners offered the option of lodging to their customers obviously without a license since legally there is no possibility of engaging in two self-employed activities at the same time. 8. Self-employed taxi drivers will be left out of this discussion due to a lack of sufficient time with which to analyze and interpret the data collected. However, impressions would indicate that despite being of more humble origins, on average private taxi drivers share many of the same complaints of their self-employed counterparts in the housing and restaurant sectors. 9. Later he reiterated these numbers, changing the second figure to “between 30 and 40 paladares left.” Such “exaggerated” numbers were corrected by a young Cuban scholar who has done research on the CP economy. However, she did echo the general spirit of his criticism confirming that the number of private restaurants has shrunk considerably over the past 18 months. Ted Henken is an Associate Professor in the Depart- ments of Sociology/Anthropology and Black and Latino Studies at Baruch College, City University of New York (CUNY). He recently co-edited the com- prehensive reference book Cuba in Focus with Miri- am Celaya and Dimas Castellanos, published by ABC-CLIO Press in October 2013. He is also the co-author with Archibald R.M. Ritter of Microenter- prise and Public Policy in Revolutionary Cuba (First- ForumPress, 2014). He writes the Cuban-themed blog, El Yuma.